So, I failed. I was one of the last ones in the office and it was just me and the brownies. Apparently the brownie explosion party was an ice cream and brownie sundae feast. Luckily, I avoided most of it, but I did end up having a brownie and an oreo. Boo. It wasn’t that good either (no offense to who ever made it). I think I’m more of a chocolate chip cookie girl. I dunno. 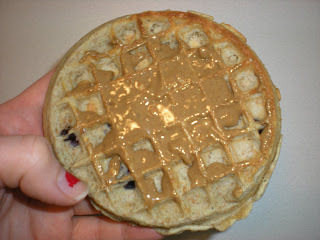 Before the brownie I had a Kashi Waffle with PB. 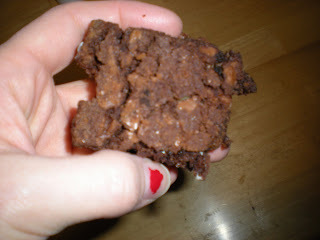 I thought this would prevent a brownie breakdown, but alas it did not. 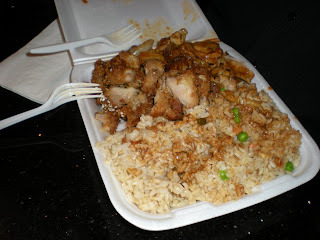 Dinner was at my favorite little Chinese place. It is kind of like a fast food place, but you can order vegetarian versions of everything. 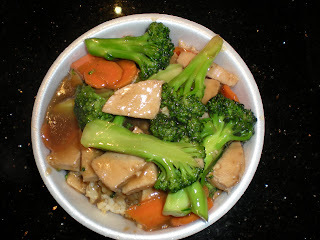 I got a bowl with brown rice and “veggie” chicken broccoli. I stole some bites of the BF’s food too. He got this chicken that was so good. 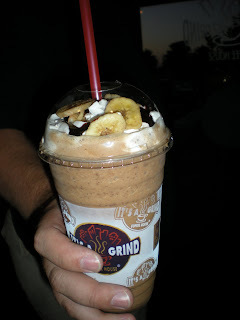 Dessert was a Chunky Monkey drink thing from It’s a Grind. There was a sign outside for this drink describing it as some mix of chocolate, PB and banana. It was too good to pass up. I probably had 1/4 of it and let the BF have the rest. I went out for drinks in Manhattan Beach with a couple girlfriends after I dropped the BF off at the airport. I didn’t have a drink though, wasn’t feeling it.